As my washi tape collection grows bigger and bigger I thought it was about time I used some of them up. My Pinterest boards are full of Easter and Spring crafting and I wanted to make something with my 3 year old who is currently exploring eggs at his nursery. We decided on pretty washi tape Easter eggs. You will need – a variety of washi tapes, card, scissors and contact paper (also known as sticky back plastic). 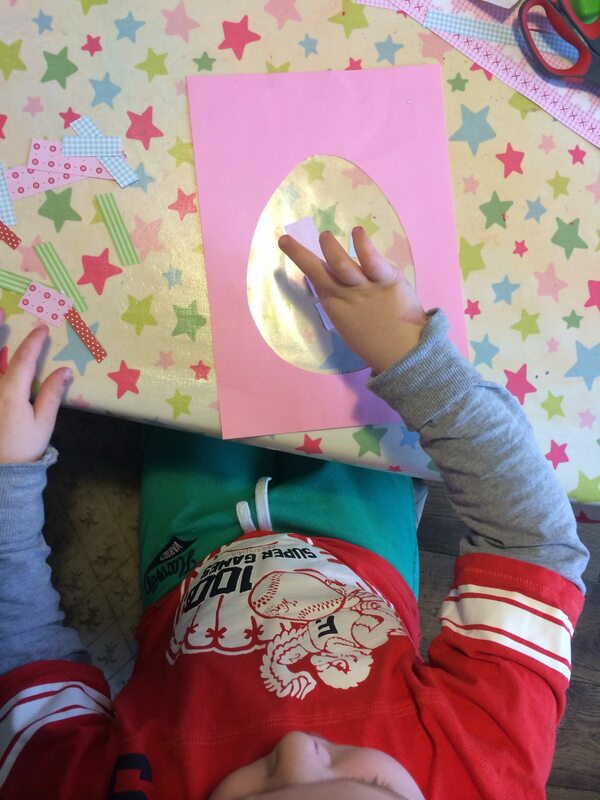 On a sheet of card draw an egg shape and cut it out. Place a sheet of contact paper over the hole and fill with pieces of washi tape. My son loves cutting so was happy to snip small lengths of washi tape and place randomly inside the egg shape. When you’ve finished cover the other side with contact paper to seal and trim around the egg. Punch a hole in the top and thread a piece of bakers twine through to hang. Love that- easy enough for a toddler to do, yet resulting in something pretty enough to display! Awww what a lovely activity! I reckon my 3 yr old niece would love this! Looks great – as someone said, easy for a toddler to achieve and looks lovely! Such a simple but effective idea! Great for fine motor control as well. I’ve been on the look out for washi tape but yet to see any! Ha, thanks! It took me a while to build my collection up! Tried to comment earlier, but can’t see it – apologies if you get two! I’ve Pinned – it’s a great idea 🙂 And I want your washi collection!! This looks great! Both washi tape and sticky back plastic are something I am meaning to use more of in crafts! There are endless possibilities for crafting! Ooh like this idea. Have to try, I’m not usually very crafty but this looks simple enough lol! How great, and makes a beautiful sun catcher too. Thanks for sharing with the #pinitparty. Have pinned…a couple of times! 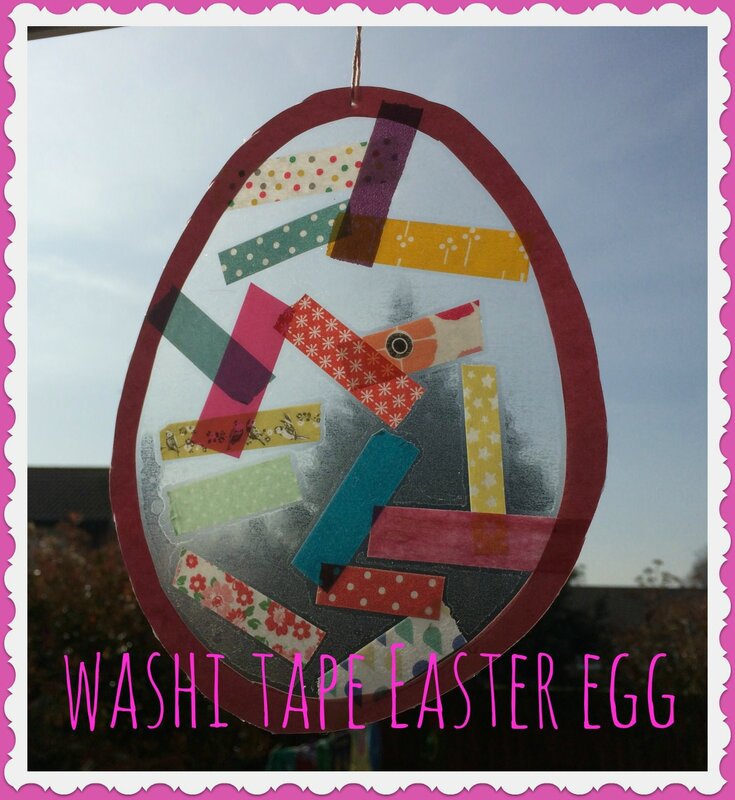 Love the Washi Easter Egg craft! We love contact paper AND Washi tape. Pinned!! Found your link from the Parenting Pin It Party! love it, so simple, !